...ten minutes to survive the past. Skylar Haines has struggled with personal demons most of her life, going to dark extremes to subdue anxieties rooted in her tragic past. On a perpetual hunt for the next adrenaline hit, she discovers a passion for flying and becomes a hard-edged stunt pilot, verging on obsession. In the sky, following her most daring airshow, she encounters a mysterious storm and almost collides with another aircraft, sending her into a perilous dive. Guided by a mysterious voice, she manages a safe landing but finds herself transported to another time. Eight months before she was born. One week before her father was murdered. Though baffled by her circumstances, Skylar soon arrives at a single certainty: Before her lies a remarkable chance to change her family's destiny drastically for the better—or possibly even worse—depending on the choices she makes, before her window of opportunity closes. In the late 1950s, three planes under the ownership of United Airlines were lost in mid-air collisions that killed everyone on both aircraft involved. On June 30, 1956, Flight 718 collided with a Trans World Airlines Lockheed L-1049 Super Constellation over the Grand Canyon in what was then the world's deadliest commercial airline disaster. In 1958, Flight 736 crashed in southern Nevada after colliding with a USAF F-100 Super Sabre fighter jet. And on December 16, 1960, Flight 826 hit another TWA Super Constellation over New York City. These accidents helped pave the way for modern-day air traffic control. Also in 1958, United Airlines received its first Douglas DC-8—the first jet aircraft to fly from Los Angeles to Chicago and on to New York. I remember sitting on my father's shoulders, watching this plane take off from the tarmac at LAX, and later riding on board, handing out Chicklet gum to all the passengers. At that time, it didn't seem possible that air travel would grow to the unimaginable scale we enjoy today. I've been privileged throughout my life to visit every country in Europe, a few in Central America, ditto in Africa and most of Asia, not counting trips to Australia and more than 100 throughout the United States-all by air. As a result, I knew that someday I would write a story about flying to a remarkable place. Then seven months ago, my husband came up with the wonderful idea of tackling one that involved time travel as well. It seemed that the perfect opportunity to turn my creative juices loose had presented itself with the completion of my Threads series. Thus, I went to work, creating this romping adventure/romance with an unexpected twist or two. 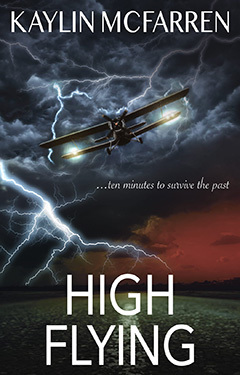 "High Flying" is one of the most unique suspense thrillers I have read in a while. I highly recommended reading Kaylin McFarren's story for intrigue, deception, kidnapping, and an excellent perspective of self-harm. Skylar shut off the engines and the airplane shuttered. The propellers slowed and stopped with a jerk. Silence. She started to remove her headset but stopped and said into the mic, "Are you still there? I can't thank you enough." "It was nothing. Glad to help." "I don't know what got into me. I've never panicked like that before." "No problem. Happens to the best of us." "But I'm used to emergencies. I've done it a thousand times. I do stalls for a living!" She hesitated, embarrassed to admit such a thing. "Well, thank you. I really can't thank you enough." Then she realized she didn't have the foggiest idea who he was—this guardian angel who saved her. "Can I ask who this is?" "The name's Haines," he said. "It was my plane your clipped up there. But I managed to bring her down safely." "That was you! I don't know how that happened. You just appeared and I only had a second to react. I'm so glad you're okay. That I'm okay too...thanks to you." "Like I said, glad to help." "Wait a minute. Did you say Haines?" She must have misheard. Or perhaps it was the near-death experience confusing her further. "Yep, that's right. Dylan Haines." He paused, then he asked, "Have we met before?" "Um...I..." Skylar looked around and realized that she wasn't sure where she was. None of this was making sense. She pulled off her headset, thinking she could see better without them. She looked around for Jake. Where was Ethan? The airshow was still going on and groups of people were gathered here and there, filling the open spaces outside. Leaving her backpack behind, she climbed out of her seat and hopped to the ground. Where was everyone? Where was Jake? She was having trouble believing her eyes. A short distance away sat the brick traffic control tower and administration building. People were milling about, going in and out of the buildings. And she knew these buildings well. She saw them every day. She also knew that they had been remodeled a few years ago. But the building in front of her had clearly not been remodeled. It had the old windows and doors, and the addition that gave them more offices wasn't there. Draped across the black façade was a huge white banner with black letters. She couldn't believe her eyes. Welcome to the '97 Reno National Championship Air Races & Air Show! What? 1997? Was this some kind of joke? Skylar looked around, half expecting someone to jump out and yell, "Gotcha!" All the buildings around her looked the same but different. Everything was just a little bit off. She took another look around. The hangers were there, but where was the shed? She used that shed daily for tools and wash pails. The small maintenance building was there, however, the large newer side wasn't. It was just a parking lot. Skylar scanned the whole airport and realized it wasn't making any sense. This wasn't right. None of it was right! Antique planes of every make and model were lined up in neat staggered rows. Pilots were checking engines, climbing in and out of cockpits, and studying the reader board for their positions. Red and white checkered canopies had replaced the black vendor tents that had been there this morning. The grandstands were still filled to capacity, yet none of the faces looked familiar. Not even the faces in the "Employee Section." And there was still no sign of Jake and Ethan. Plus Jake's biplane wasn't there and his hanger was nowhere in sight. Was she losing her mind? A striking man with wavy brown hair and an athletic build strode up to her, wiping his hands on a rag. "So, you must be Skylar. It's good to meet you. And all in one piece." A bright smile stretched across his face. She returned his smile and realized that she recognized him. Her brain started filing through faces and names, searching for something to remind her who this man was. Then a picture came to mind. She knew a picture of this man. That was it! Skylar had seen his face in her grandfather's album. Only, that album was filled with photos of her father. He looked exactly like a picture of her father. But that was impossible. Wasn't it? Skylar looked at him a little closer. Same hair. Same sea blue eyes. If her father had a twin, this would be him. But wait...it couldn't be. He didn't have a twin and this man looked to be 26-years-old. The world came to a standstill. It was 1997! Her father would have been twenty-six in 1997. This was crazy, and so was being here, in this place—in the same year and place where her father had died. Skylar kept her clammy hands clenched at her sides and squeezed her eyes tight. This is all a dream...just a dream. Either that or she was dead. She must have crashed and died on impact. That was it! She was...dead. She opened her eyes again, but everything was the same. Still 1997. She broke out in a cold sweat. A tingling sensation began in her hands and feet and then quickly spread to her entire body. Her father stepped forward and reached out a hand. "Skylar? Are you all right?" She simply stared, mystified. "This...this isn't real. It...it can't be," she stammered. "It's...a dream. Just...a dream." He was tilting off center before her eyes, blurring into fuzzy grayness, disappearing as the world went black.